When I say ‘unique’, I’m talking about unique on the iPhone. 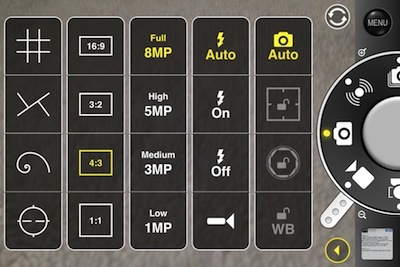 The ProCam interface may actually look familiar to many digital camera users as the camera app mimics real world buttons. But, with settings and adjustments that I wish my digital camera had. The user interface for ProCam, while very un-iPhone like, looking more like a physical camera, makes it easy to change settings quickly. When I’m doing street photography, I usually have to choose a setting and shoot for the better part of the day with it. 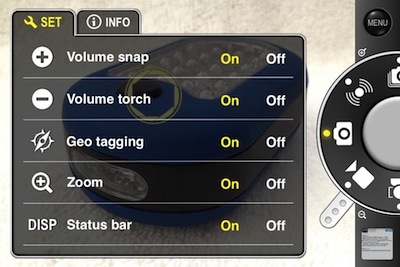 Many ‘camera’ settings are offered in the popular app solutions, but every change are a couple taps deep. With ProCam, everything can be done with one tap or a twist of a virtual nob. The small tab out of the ‘dial’ is used for controlling the 6x zoom. 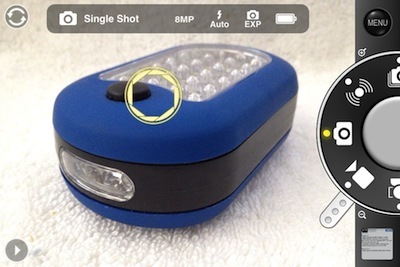 Choose the arrow button on the lower left corner to expose the specifics on how you want your iPhone’s camera to work via ProCam. Tap the options to change, the single window makes it easy to change while on the go to get a specific shot quickly. There is also several screens worth of fine tuning all of the features via the Menu button (upper right). ProCam keeps the settings simple and quick too with a tap to change On/Off or quick chooser showing in a single view rather than having to drill down for every adjustable line item.